Rajasthan is most popular tourist destination of India. Travelers from all over the world come here and satisfy themselves by witnessing the beautiful palaces and forts; magnificent beauty of the forests and breathtaking scenic beauty all around. Fort are present all around Rajasthan. Here we are trying to shortlist the names of 10 most popular forts of Rajasthan and some information regarding them. Amber Fort or Amer Fort is situated in Amer, on the top of a hill. Its main attraction is Jaipur city. The fort was constructed by red sandstone and marbles. Amer fort is popularly known as the Amer palace. This palace was the residence of the Rajput Maharajahs. The fort was declared as UNESCO world heritage site along with five forts of Rajasthan. Mehrangarh Fort is one of the largest fort of India. it is situated in Jodhpur. The museum of the palace exhibits arms, paintings, costumes and the rooms of the Rathore’s. The museum also has a enviable selection of palanquins, used by the the mighty Rathore’s. This fort is situated at the heart of the city of Jaisamer. The walls of the fort is made of yellow stones. The colour of the fort changes its shades in different day times. It looks tawny lion colour during the daytime. It looks honey- gold during the sunset. For this reason the fort is widely known as “Sonar quila” or “Golden Fort”. It was declared as UNESCO world heritage site in 2013. The Chittorgarh city is situated in the bank of river Gambhiri and Berach. This fort is the largest fort of India and Asia. the fort was under siege thrice and every time the inhabitants fought bravely and sacrificed their lives, including women and children. Jauhar was committed by women and children led by Rani Padmini in the war against Alla-ud-din Khilji. The fort is now declared as UNESCO world heritage site. Kumbhalgarh Fort is Mewar’s defensive wall situated at the western renge of Aravalli. It is also the birth place of Rana Pratap, The great warrior of Mewar. The wall of the fort is the second largest wall of the world after the “Great wall of China”. The residential buildings and temples are well maintained inside the fort walls. Ranthambore fort is situated at the center of the Ranthambore national park. The wall of the fort is 7km long. There are many ruins of buildings inside the fort. Number of temples are also there inside the fort like famous Ganesh temple. Magnificent view of Ranthamber national park can be seen from the top of the fort. Situated at the edge of Aravalli range Nahargarh fort creates strong defense for Jaipur city along with Amer fort and Jaigarh fort. The fort was built in 1734. The view of the city of Jaipur from the Nahargarh Fort charms the visitors. Another attraction of the Nahargarh fort is the biological park which is inside the fort. Many Bollywood films were shot here. Built by Jai Singh-2 in 1726, Jaigarh Fort is situated at the Aravalli range. The excellent view of Aravalli range and Amber fort down below can be seen from the Jaigarh fort. The museum inside the fort exhibits pictures of the royals of Rajasthan, swords, guns etc. Junagarh Fort is situated in Bikaner. The modern city of Bikaner has developed around the fort. The fort was established by Rao Bika in 1472. the structure of the palace was made by red sandstone and marble.The fort has seven gates and many temples and palaces. The museum inside the fort displays royal jewels, costumes, paintings, armours etc. 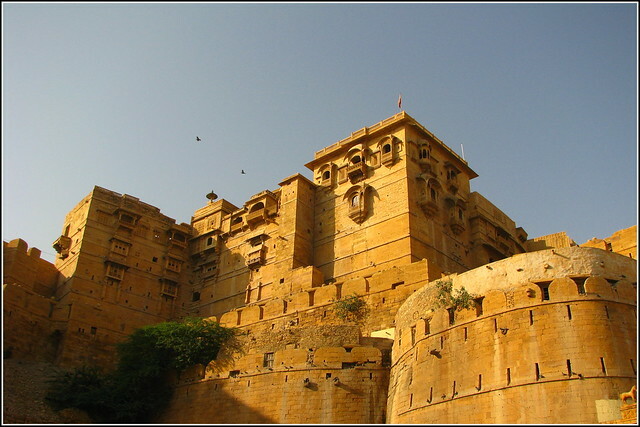 Gagron fort is situated in the Jalawar district of Rajasthan. The fort was created in 1195 AD. The river water of Kali, Sindhu and Ahu river surround the Gagron fort from three sides. There is a darga of a sufi saint outside the fort. A grand fair is conducted here every year.